Muchinga Province Police Commissioner, Auxensio Daka, has called for peaceful and issue-based campaigns in the run up to the August 11 general elections. Mr Daka has warned that political parties that will not adhere to the Electoral Code of conduct and the Public Order Act in the province risk being arrested or jail. Mr Daka says all political parties should try by all means possible to conduct violent-free campaigns in order to maintain the good record Zambia is known for of having peaceful elections. He said this in an interview with ZANIS yesterday following the violence that occurred in Shiwang’andu, Isoka and Mafinga districts during the United Party for National Development (UPND) campaign tour of Muchinga Province. The Police Commissioner urged all political parties to respect one another, avoid name-calling and the use of sharp instruments such as machetes (pangas) as they campaign. Mr Daka added that there is need for political parties to be peaceful in the manner they conduct their campaigns, be it from the ruling party (PF) or the opposition to ensure that there is no bloodshed in the country. He called on all political parties to aim at explaining their manifestos to electorate without engaging in political violence. The Police Commissioner has further warned politicians of stern action if they do not follow the laid-down procedure of conducting campaigns. Mr Daka has called on all Zambians, in particular people of Muchinga, to continue safeguarding the peace that the country has been enjoying over the years and promote the ‘One Zambia, One Nation’ motto. He has also called on the Church mother bodies to continue praying for the nation before, during and after the polls. However, the Provincial Police Commissioner thanked the people of Chama district for not engaging in political violence during the United Party for National Development (UPND) rally held yesterday. If UPND wins and HH dies the GBM become republican president. Can you imagine a Country ruled by GBM? Please stop joking with us. How many times are you going to warn Political Parties? You must by now have arrested all the identifiable violent chaps be they from PF or UPND. Spare us the rhetoric and go out after those chaps in the picture and others. I am so disappointed with what I have just read. I was expecting to read that the person in the picture and all his accomplices have been apprehended and are helping Police with investigations. Lungu has failed Zambia. Even Sata who was violet now looks like a saint compared to Lungu. If the violet cadres were UPND, they would have been arrested & not warned. 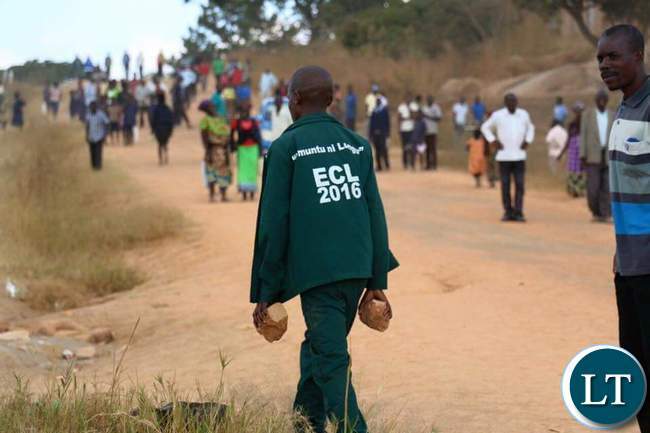 In Madevu, PF cadres threw stones at the Police and UPND who were going door to door. But Lungu is quiet. Yet he will come tomorrow and say One Zambia One Nation and that he is a Christian. Shame on the Christians who are supporting him. I find it hard to think we have the police. the IG does not seem to be serious about the violence taking place more so if PF is on winning side. You are showing us pictures of savages with stones and what is coming out is warning. The reporters have even gone to the extent of showing you what is happening ..the police are investigating. can the police please shows us what they are trained for? When the government changes the entire management of the police should be arrested for encouraging violence in peaceful Zambia.